The name comes from the Greek sarco – fleshy, cheilos – a lip; because of the fleshy labellum of the flower. While minutiflos = having very small flowers. 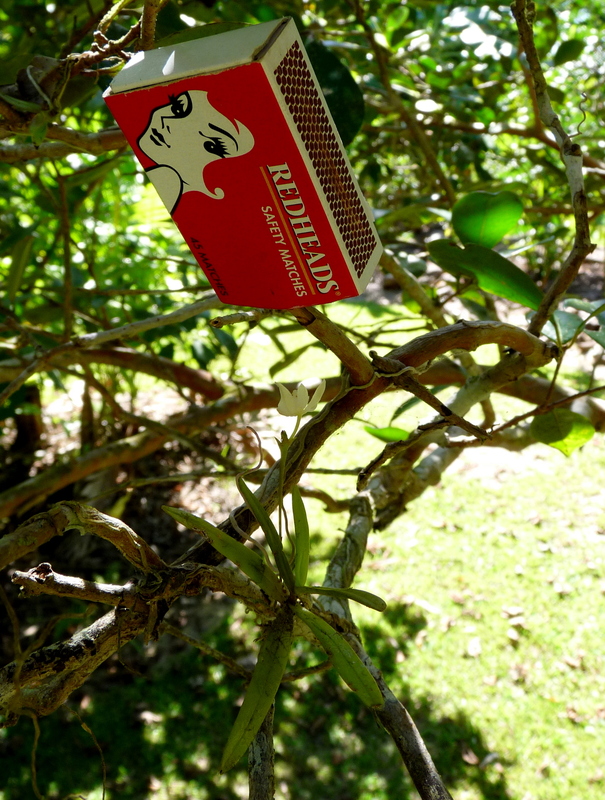 This is truly a tiny epiphytic orchid, I have placed a match box above a typical plant to give some sense of perspective. Because of its diminutive size this orchid is very difficult to find. It tends to grow on the fine twiggy branches of well lit and ventilated trees. luckily I have found some that are growing on a small myrtaceae tree growing in our house garden. They often grow in small colonies which is probably a good thing as each individual plant does not last many seasons before the twiggy branch dies back and falls off dislodging the plant. I first noticed the flower inflorescence forming several weeks ago and have been keeping a bit of an eye on the plant to catch the flower. And a couple of days ago the flower bud started to form. The bud is about 5 mm across and took about 3 days to open. The plant species by the way is often confused with a similar one Sarcochilus hillii which tends to occur a bit south of us. I have also found several plants growing on a Soursop tree in our fruit orchard. 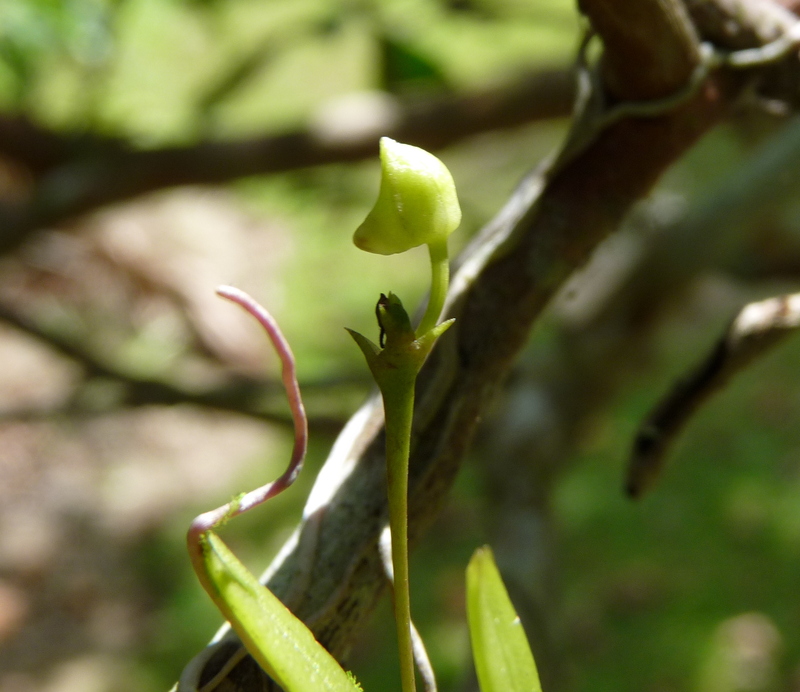 Soursops have a habit of the twiggy branches dying back. Which is why I first noticed that there were orchids in the tree. Several rotted twigs had fallen off in the wind and there were some very unhappy looking orchids on the decomposed wood. I then carefully scanned the tree and found that there were plenty more on slightly better conditioned twigs. As I have yet to see a plant growing on a robust branch it suggests to me that the orchids must need a lot of light and ventilation to establish and perhaps the decomposition of the woody material provides the nutrient for these delicate young plants. 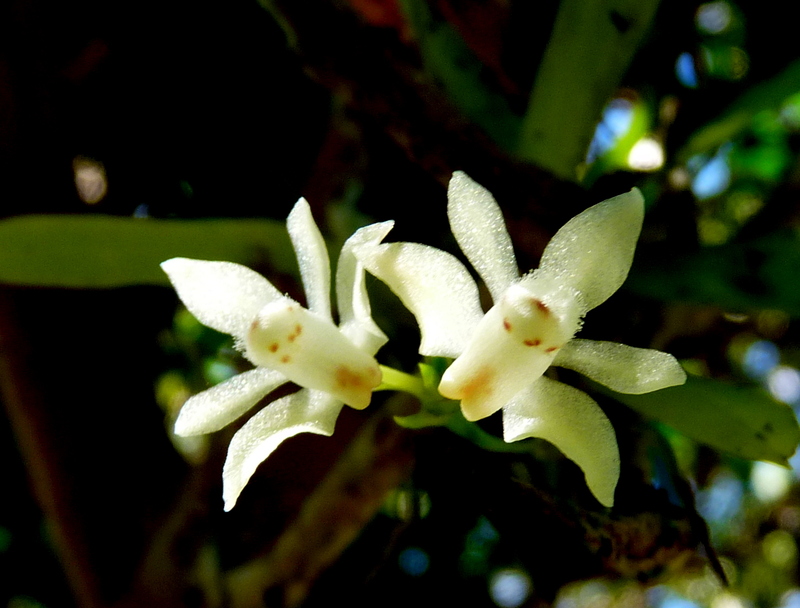 This entry was posted in Daintree Plants, Orchids and tagged White Bells Orchid. Bookmark the permalink. A very interesting essay. What a delightful little orchid. Nice report of an interesting Orchid. I get the Orange-blossom Orchid (Sarc. falcatus) in NSW Southern Highlands, and I recently saw Sarc. hillii growing (but not flowering) near Nowra. It was really tiny. Yes Lorraine it is a lovely little orchid when you can find it. Hi Denis, like you I do enjoy the orchid group of plants. This is the time of year when quite a few of the local species will flower so I keep a special look out. While this is a small orchid another one that will flower over the comming months is Oberonia titania. It to is a tiny plant but the flower is minute. It will be a challenge the get an in focus shot.